Running a program as different user is one of the easiest way to impersonate a Program/Application with some other user's privilege. For every administrators, this would be common need either for testing or to impersonate different user privilege. 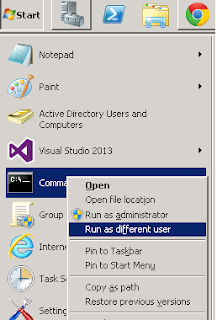 You can run a program under a different user account by using the command line tool RunAs. Use the below command to open new CMD window under different user account. You will be prompted to enter password when you execute this command. type password and click 'Enter' to open new cmd window under the different user 'TestDomain\Smith'. Hold down the "Shift" key on your keyboard, then right-click the program you would like to launch and click the option Run as different user. 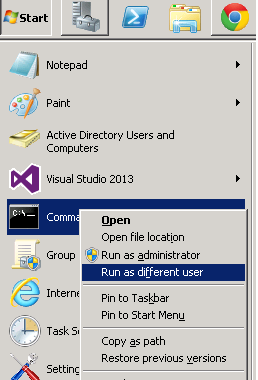 This will works only on application launch files (EXE) or shortcuts to application launch files.